Such intricacy, he knew, must have been designed. Even in his teen years when he rejected the Catholic tradition he’d grown up with, Vincenzo said, “I always believed in a Creator-God, that the universe must have originated from Him.” But little did he know that this Creator-God was also an intensely personal God who would reach out and change his life in ways he would never have imagined. That youthful passion for plants led Vincenzo to study plant production and pathology at the University of Naples Federico II. And eventually he would go on to earn his PhD in agrobiology and agrochemistry. “My dream was to be paid to study,” he says. He was living his dream! There were no opportunities for this kind of microscopic research in Naples, so Vincenzo began looking for opportunities overseas. He found a researcher at Virginia Tech who was working on the exact kind of research Vincenzo was looking for. By the time Vincenzo arrived in July of 2009, the researcher had switched his research focus from plant pathogens to human pathogens. 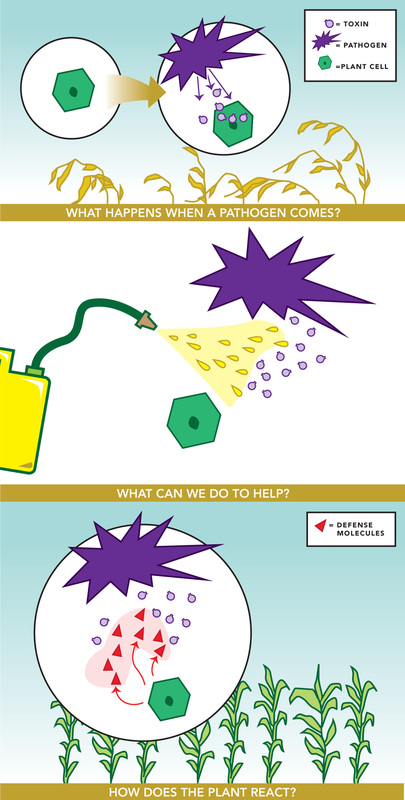 Vincenzo had a theory that some human pathogens used the same mechanisms that plant pathogens did to infect cells. Fortunately, “it was just a matter of applying the same model for different systems,” Vincenzo explains, so it supported his PhD work just as well. But God had other reasons for bringing Vincenzo to Virginia Tech. And He was about to totally change Vincenzo’s life. At the same research lab, a scientist—and a Christian—named Danielle Choi was working on her PhD in bioinformatics. When she challenged Vincenzo to read the Bible, he said, “Sure, why not?” They went together to buy a Bible, and at Danielle’s suggestion, Vincenzo began reading the Gospel of John. “Going through the book of John was like turning on a light in a dark room,” Vincenzo says. “Everything just made sense. And so I professed by faith, I needed a Savior. And I accepted Jesus Christ.” The Creator-God had now become his God and his Savior. Immediately, Vincenzo’s life was transformed. “My approach toward others, especially co-workers, changed radically,” he says, “from night to day.” No longer was his goal to promote himself and to push others down. He now found himself encouraging others to grow and excel. Vincenzo finished his research on “Trafficking of Virulence Factors in Plant and Human Cells” in January of 2011 and returned to Italy to defend his dissertation. 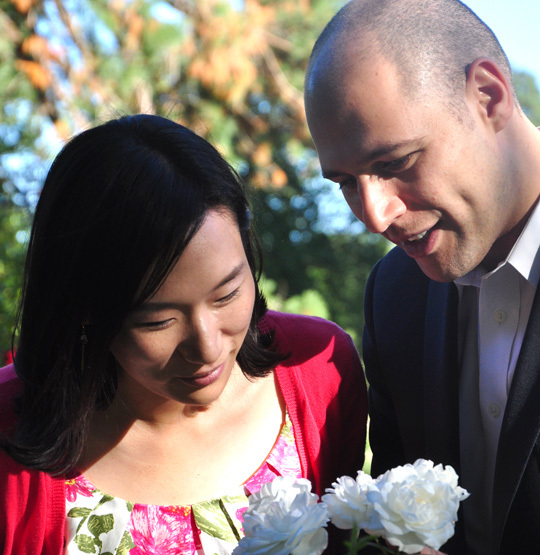 Later he returned to Virginia Tech as a postdoctoral research assistant—and began dating Danielle. Despite this exciting career development, Vincenzo found that the research life was losing its appeal. So Vincenzo began scouring the Internet for university faculty openings that would match his background. Danielle, who was by then his fiancée, encouraged him not to give up. She reminded him that God had a plan and that He would provide for them. And then Vincenzo discovered the opening at Bob Jones University. He applied, interviewed over the phone, and was offered the job! As a non-U.S. citizen, however, the process from that point to actually becoming a professor at BJU took nine months of complicated paperwork and multiple steps of faith. In January of 2013, Vincenzo and Danielle were married. And in June, Vincenzo resigned his position at U of M, still not knowing whether the position at BJU would work out. But the Friday before Faculty In-service at BJU, all of Vincenzo’s documents came together. And BJU was able to officially welcome him as a professor in the biology department. 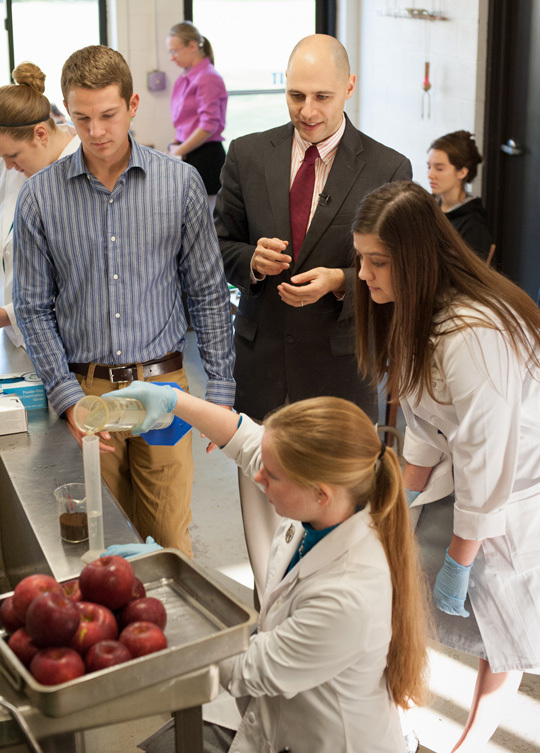 As a professor at BJU, Vincenzo enjoys teaching classes such as General Biology, Organismal Biology and Plant Physiology. Three of his main objectives are to share his knowledge and experience with his students, to challenge their critical thinking skills and to encourage them to develop their God-given talents. In each of those areas, he teaches them the importance of working with others. By assigning frequent group activities, Vincenzo says, he wants his students to learn to be not only good leaders but also good team players. Vincenzo’s heartbeat for working as a team extends beyond the classroom. When he was a new believer, joining a Bible study group and spending time with accountability partners were invaluable to his spiritual growth. So here in Greenville, he and his wife are giving back, actively participating in their church’s shepherding groups, where their personal focus is mentoring younger believers. Vincenzo’s passion for discipleship is evident in his ministry at BJU too. 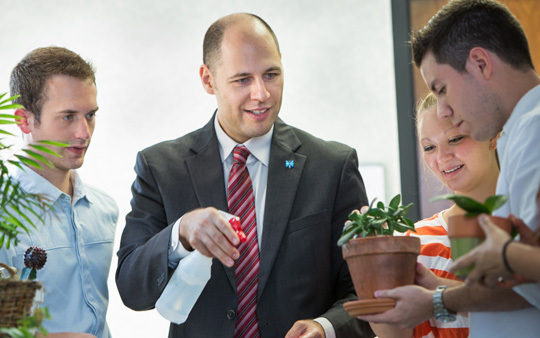 He is convinced his role at BJU is more than contributing to his students’ academic experience. And because of the way God has worked in his own heart and life, Vincenzo seeks to have an active role in his students’ spiritual growth as well—sharing personal anecdotes along with Scripture and countless cups of his beloved Italian coffee along the way. And this is where Vincenzo’s true joy lies. It’s not just in plants (even premium Italian coffee plants). It’s not just in scientific research (even though he is still passionate about pathogens). And it’s definitely not in promoting himself (ever). Vincenzo Antignani’s deepest satisfaction is in using everything God has given to him to point others to the awesomeness of his Creator-Savior Jesus Christ.